s we sit in our hotel in Austin, TX, waiting to return home after having recently completed a very successful collaboration with C. Bobsin Organbuilder in San Antonio, TX, we wanted to share with you some of the joys and sorrows of the project, in hopes that something positive from the experience can leak out of our minds and into the organ-building milieu of our time. As you will come to see, what we have accomplished was nothing revolutionary, but we hope the principles we encountered may be able to assist our colleagues in some way. 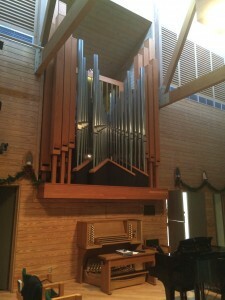 Our patient in this project is a 1900 Moller, First Presbyterian Church, Austin, TX, original to the congregation, but moved in the 1960’s to it’s new home in the Mesa suburb. Quite a list of builders had their hand in making alterations to the instrument, with mixed successes. As occurs with many instruments from this time period, the larger 8′ stops were replaced with upperwork, and the instrument was given a German-eclectic tonal flavor, which sounded well into it’s small yet pleasant acoustic. Coming onto the scene in July 2015, we weren’t sure what to expect. A grandiose new console by Bobsin and crew had been installed, and it was time to turn serious attention to the key action, which was exceedingly heavy. Initial measurements were unable to be made, since the key action weight exceeded the limits of our usual key gram-meter! The original bass manual pallets. Perplexed, yet not surprised by the heavy key touch, we sought to determine the root causes of such, so that a reasonable solution could be concocted, while keeping the tracker action intact. As we began poking and prodding, we found the action in bad need of general adjustment, this not having been done in some time. This involved ensuring that all squares and roller arms are ninety degrees to the action when they are half-way through their travel (not in the resting position, as is a common misconception) to provide maximum travel of the action and prevent binding. Performing this adjustment in itself made a noticeable difference, though not enough to satisfy the ultimate goal. Once the action was well-adjusted, we were able to pinpoint non-ideal conditions in some of the intermediary action transfers, particularly in the Great. As a result, we built a new square rail that improved these conditions, particularly by eliminating whipping of the tall vertical trackers, and also by creating backfalls that were able to be easily geared to change the ratio of key depth to pallet drop. New pallet (right); Old pallet (left). Gearing is a common way to reduce key weight. If you realize that there are two main forces involved in a key action: tension from action weight/friction + pallet spring, and pluck, you can see that reducing the amount of pallet motion, for instance, in half in this case (2:1), reduces the amount of weight at the key from the pallet roughly by half. Somebody had been smart enough in a former rebuild to drill holes in thee Swell backfall squares to allow this, so the Swell was already geared out 2:1 when we arrived. (That being said, they didn’t adjust other things such as the tracker guide combs, so this resulted in binding). Our new backfall for the Great would allow us to gear the action in three positions: 1:1, 2:1, 3:1. We found that the action was nearly acceptable when the action was geared to 3:1, however, the speech point was then so far lowered on the key that it made playing uncomfortable. In the pallet box, where we expected over-sized pallets, as was typical from this time period, we found that things exceeded our expectations. As was typical, the pallets were the full width of the channels, which in the bass were a hefty 29mm wide! In addition, old, stiff leather was causing sealing problems, which had been alleviated in the past by adding tension to the pallet springs which, as one can imagine, exacerbated the heavy key touch problem. In addition, the Moller pallets had a type of “balancier”, which is an added mechanism that uncovers a small hole in the channel, equalizing the pressure so that the pluck was then reduced for the large pallet. While this seems like a clever idea, the added mass of the mechanism, in addition to the lost motion in the balanciers, made the basses heavy and mushy feeling. Our immediate conclusion was that the pallets were too big, and we needed to make the pallet openings smaller. But how? This was the million-dollar question. Due to situations beyond our control, removing the chests was not an option. Whatever solution was applied needed to be implemented with the chests in situ. We took extra care to think through each step of implementing this so that we would not run into any problems that would be caused by working within the deep, short pallet box. Considerations for access and installation led us to follow the advice of a colleague who recommended shimming the channels to reduce the slot width. So then we needed to know how much we could reduce the pallet slots by without causing wind problems in the channels. First, we gathered the necessary data on our end by adding together the windways of all the pipes on the channels (we used the C’s). 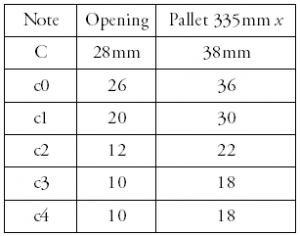 We consulted with two well-known builders, who graciously provided us with their own formulas for figuring pallet openings, pallet drop, etc. We also came across a wonderful essay on the subject by Colin Pykett (http://www.pykett.org.uk/calculating_pallet_size.htm). 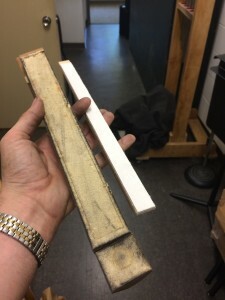 Pykett had produced a series of controlled experiments to find out how large exactly a pallet slot needed to be, not only to provide enough wind at a stable pressure, but to do so under varying loads, to prevent “robbing” of wind from mixtures, etc. I suggest that anyone needing to scale pallets absorb this data. We found that his data indicated larger pallets than that dictated by the formulas provided by our colleagues, and since our calculations revealed pallet openings that were already significantly smaller than the originals, we stuck with the larger formulas. Pykett’s data also included information on pallet drop, especially compared to the width of the pallet. The consensus from Pykett and our colleagues was that the pallet should drop half the width of the pallet. Since our current pallet drop with the action geared 2:1 was 5.5mm, we made the bass pallets 12mm, and kept the treble pallets 10mm. Of course, these were still generously scaled according to our calculations. So we furthermore reduced the area of the pallet opening by inserting blocks in the back of the pallet slots. (We only performed this second operation in the Great). We made new pallets out of basswood, in the same style as the originals, which curiously have no tails, but pivot on the leather. This allowed us to keep the back pins in-place for re-use, and we were able to use the original spring-loaded tail hold-ups in the treble. The balancier holes were covered with a membrane, and the new pallets have extensions to carry the motion to the original pull-downs. 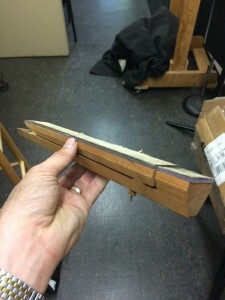 The original pallet springs were straightened and re-used. We were able to regulate the pallet tension to max 125gr at the pulldown, without any problems with repetition or sealing. The Great and Swell were geared back to 2:1, and the key tension at the key is now about 125gr, and very pleasant to play. There is no detectable robbing of wind when larger stops are added. In the end, one of the caveats of this project was the fact that the major wind-hungry stops had been replaced with upper-work. 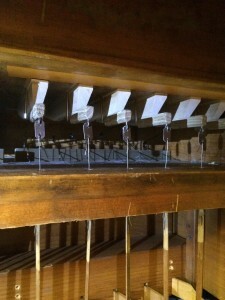 If the organ’s stoplist had been original, such drastic changes would have been reduced by necessity. We also have vowed never to perform this operation again without taking the chests out. Though we were able to reduce the amount of necessary work inside the pallet boxes through careful planning, the operation was still extremely difficult, and took an exorbitant amount of time to produce the high-quality results necessitated for this precision operation. In the future, in a non-historic instrument, we would most likely opt to remove the chests and install a new pallet board with routed slots. I realize the fine details of this project are too exhaustive for a blog post. If anyone has any questions about this procedure, please feel free to ask!